A couple of months ago Jvee and I had dinner at Misfit in Santa Monica where they end each meal with complimentary salted chocolate chip cookies. I KNOW. It was my first time trying them and they were amaze. I never wanted to eat a chocolate chip cookie without salt on it again. 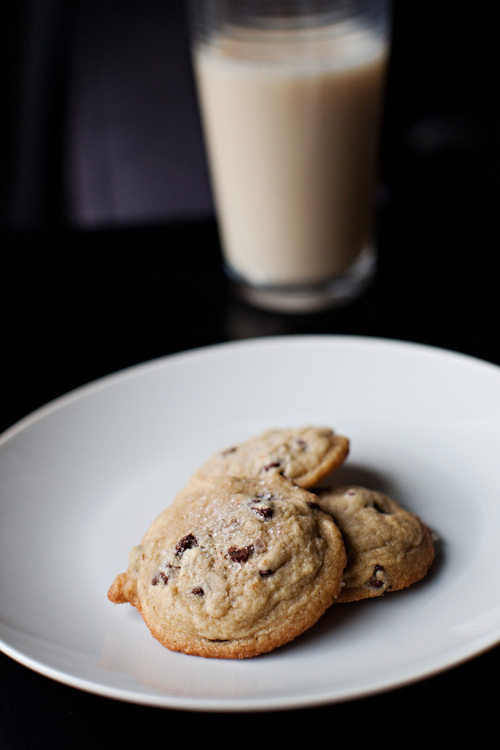 We have a few cookie recipes that we’ve collected and adapted over time. Now this is one of them. These are a soft, salty-sweet cookie that is surprisingly enjoyable. Pre-heat oven to 350 degrees. Sift or whisk flour and baking soda together. Beat butter and sugars together until fluffy. Add eggs, vanilla, and salt and blend well. Slowly add dry ingredients into the wet mixture. Stir in the chocolate chips until evenly distributed. Use a spoon or cookie scoop and drop dough onto a baking sheet lined with parchment paper or a silicone mat. Bake for 11 minutes. Remove from the oven and sprinkle with your choice of sea salt or fluer de sel. Let cool. Yum! These are dangerous to me, lol, but they’d make a great treat for me to bring to a party. My friend Katlyn is obsessed with pink, and her birthday is coming up… :o) Thanks for sharing.